The ‘Beyond Aid’ agenda – what, who and for whom? Chapters of the Pan-African Coalition for Transformation met in parallel working sessions during the recent African Transformation Forum to agree action plans for implementation and next steps to make the Coalition work. Left to right: Nick Thompson, CEO at Tony Blair Africa Governance Initiative; Julius Gatune, Snr Research & Policy Advisor, ACET; Fadel Ndiame, Regional Head – West Africa, AGRA; Vanessa Adams, Vice-President, Country Support and Delivery, AGRA; Simeon Ehui, Director, Food and Agric. Global Practice, World Bank. 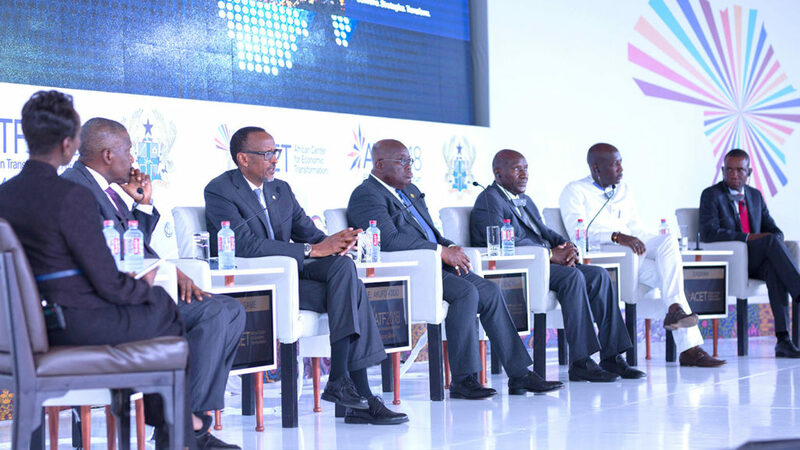 In 2016, the African Center for Transformation (ACET) and the Government of Rwanda convened the first African Transformation Forum in Kigali. It attracted hundreds and became a seminal point for accelerating the transformation agenda in Africa. Rather than being just another place for policymakers and development partners to talk shop, the Forum was a robust exploration of transformation policy challenges – and a catalyst for new approaches, the most notable being the Pan-African Coalition for Transformation (PACT). A peer-to-peer policy learning platform that connects like-minded countries around research and good practice, PACT is rooted in the simple concept that African countries can accomplish more by working together than apart – particularly when it comes to reaching transformation goals. Rwandan President Paul Kagame, closing the 2016 Forum, called on participants to be aggressive and work collectively to create, in his words, “a mindset of urgency, ownership, responsibility and service.” PACT was seen as an innovative way to translate those words into action. Dozens of participants attended each of the parallel sessions, which featured individual presentations as well as moderated panel discussions and open Q&A to ensure everyone provided input. PACT comprises individual Chapters centred around a key driver of economic transformation and includes six to twelve African governments that self-select to participate. ACET has taken the lead in driving the research and coordinating the activities that have laid the groundwork for PACT’s development. 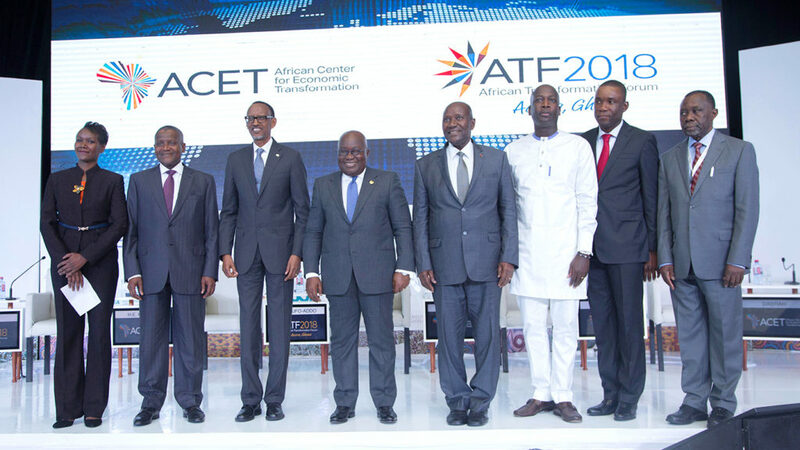 A little more than two years since its establishment, PACT now has five Chapters, and the opportunity to bring them all together to report on their progress and next steps formed the backbone of the second African Transformation Forum (ATF2018), which convened in Accra in June. The entire first day of the two-day Forum, which attracted more than 300 participants, was devoted to parallel working sessions for each of the five Chapters: Manufacturing, Extractives, Resource Mobilization and Management, Agriculture, and Youth Employment and Skills. The sessions were conceived as an opportunity for government representatives to outline their progress to date, review their biggest challenges, and seek common ground with fellow Chapter members on ways to work together to speed up progress. For the more established Chapters, that meant finalizing action plans and next steps for implementation. 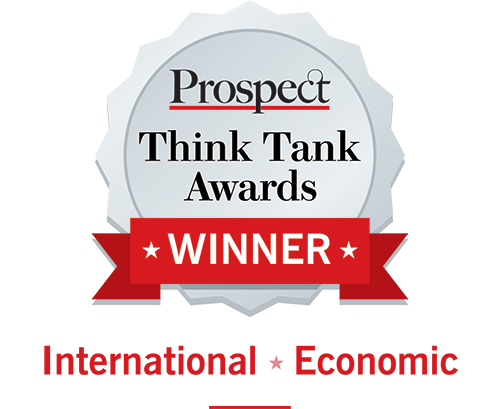 For others, it meant identifying definitive objectives to underpin their own eventual action plans. But regardless of Chapter status, the key word was action. Dozens of participants attended each of the parallel sessions, which featured individual presentations as well as moderated panel discussions and open Q&A to ensure everyone provided input. 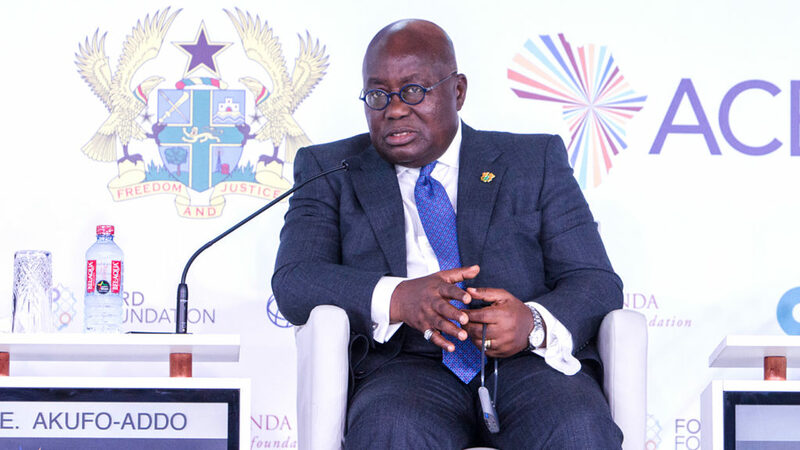 Government officials and policymakers form the core Chapter membership, but the working sessions gave all stakeholders in Africa’s economic transformation, especially the private sector, a unique chance to engage directly with government ministers and other key personnel. 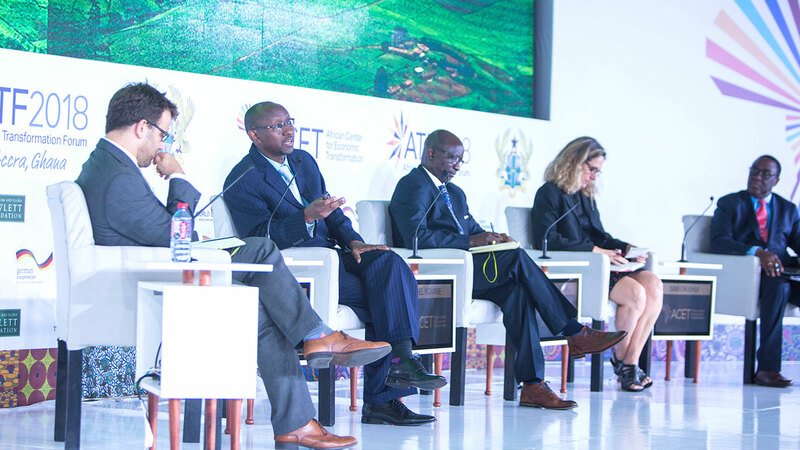 Given that the second day of ATF2018 strongly emphasized collaboration between government and business to propel transformation, the PACT sessions were a great opportunity to get the right people in the same room at the same time to share knowledge and figure out how to best work together. For instance, one of the key issues discussed at the working session for the Manufacturing Chapter was the need to increase exports to regional markets to spur industrialization and steady growth. Participants agreed that African countries need to develop a regional value chain approach, take advantage of economies of scale, and adopt smart policies to promote intra-African export. One lesson cited was the dramatic cost reduction of transporting a container of goods from Mombasa, Kenya, to Kigali, Rwanda – from US$ 4,000 to US$ 2,000 – simply by having one-stop border posts and harmonizing trade guidelines. The PACT sessions were a great opportunity to get the right people in the same room at the same time to share knowledge and figure out how to best work together. By the end of the day, Chapter members had reached consensus to focus collectively on how manufacturing exports can spur intra-African trade, and how specialization as a means of driving scale can be promoted to increase competitiveness in regional and global markets. All the Chapters tackled equally big issues. In the session on Extractives, for example, participants addressed local content policies needed to anchor natural resources as a driver of job creation and industrialization. In the session on Resource Mobilization and Management, a key topic was the role of tax incentives and exemptions as a way to maximize revenues. In the session on Agriculture, participants focused on the numerous ways that Africa’s dominant economic sector could power transformation, such as the need to better align agricultural policies with industrial policies and to promote the development of agribusiness parks to build better skills across the sector. Along the same lines, those participating in the Youth Employment and Skills (YES) working session spent the day grappling with different variations of a question that lies at the heart of Africa’s ability to successfully transform: how does the continent ensure its current and future generations are equipped with the right knowledge and skills to graduate into productive jobs? Sub-Saharan Africa is the world’s youngest region, with a working-age population estimated to surge to 600 million in 2030. Yet, in most African countries, more than 80 percent of all workers are in the informal sector. Figuring out how to leverage Africa’s abundant labour resources, as well as ensure good jobs for a booming population, is an overriding concern. After a full day of lively discussions that covered everything from basic education to the technological innovations of the fourth industrial revolution, the YES Chapter agreed to jointly focus on a few specific priority areas, including improved data on labour market projections and skills gaps, peer learning that targets increased public-private engagement and results monitoring, and policy actions that will give more attention to – and provide more resources for – technical and vocational training. Despite a full agenda, the work of the PACT Chapters at ATF2018 wasn’t confined only to day one. On the second day of the Forum, brief reports on the outcomes of each working session, either in the form of action plans or next step objectives, were shared in plenary with the full Forum. African Ministers who had participated in the PACT sessions presented the reports, which highlighted the broad range of issues that member countries had identified as central to collaborative transformation efforts, including, among many others, implementation follow-through, regulatory reform, land reform, skills development, policy coherence and coordination, special market zones, entrepreneurship, digital technology, data collection and of course private sector finance. The ministers and officials reported good progress had been made in the working sessions, and that the more established PACT Chapters were well-positioned to take another step forward and begin moving from ideas to action – specifically, implementation in the next one to two years, ahead of the next African Transformation Forum. 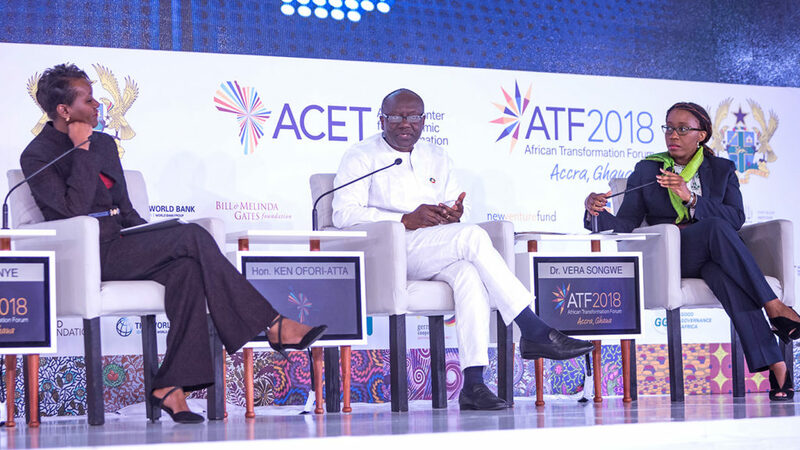 Take a look at all our stories in this African Transformation Forum (ATF2018) issue. What should be in the next issue? We would like to hear from you if you have any ideas about what should go in the next issue. If you have any stories that you think we should include, use the contact form and let us know. African Transformation Today is an online magazine bringing you top stories from the African Center for Economic Transformation (ACET).